I seem to be slowly catching up with where I was before everything hit the fan (around November, starting with the house move). 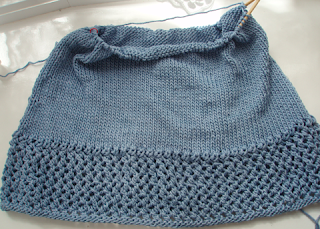 The Blue Cotton Top is back on track. I don't know if this will fit me, I'd better take it off the needles and try it on.. I'm making this one up as I go. Will need bustal region shaping, better read up on how to do that! My Wacom Stylus Jumper died - it lasted for a year of daily use, which is pretty good going really. 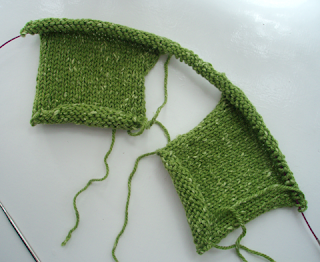 The new one is made with my first ever Tofutsies! A new project - a travelling pillow, from Lion Yarns' web site (you can find it on Ravelry too). I'm using Cleckheaton's Country Silk, my first time using this lovely stuff. This is for my wonderful Uncle Tony, who is very ill in Royal Melbourne Hospital (another body blow to our whole family...). I'm hoping it makes his time in hospital a little bit more comfortable. My dad and I are flying down to visit him in about 2 weeks, so this needs to be done by then. Does anyone know where I can buy buckwheat husks for filling it, in Australia? It's proving to be unexpectedly difficult, and they are my first choice. 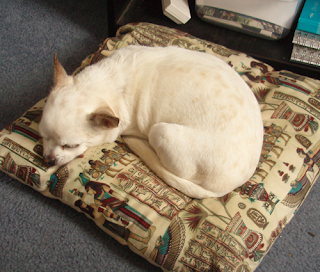 I have a buckwheat neck pillow which I bought in the States in 1995, and is still going strong and very comfortable 13 years later! Perservance is your middle name. At this reat we will see a FO with yout top. your sock is very pretty. I love that color. Ah, painting w/o a drink. I can't wait for the mug. It makes sense now. beautiful colors. I've never seen the travelling pillow befor. I use one to sleep (with fiber fill) everynight. Now I can make a cover for it. I've heard about the buckwheat pillows, my friend swears by them. Sweet Lily. She knows you need her as much as she needs you. Probably more. Every time I see that stylus jumper I laugh - but in a good way. It look so cute. And so does Lily. She's really a stubborn little pup, isn't she? BTW, it's not really a painting without a drink - don't forget it's on a mug of whatever anyway! Maybe try a health food shop for the buckwheat? Other than that I can't think of anything. 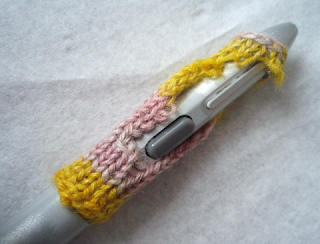 The stylus jumper is CUTE! And so is Lily. What a joy Lily is, she is so lovely. That stylus jumper is excellent!! As are the socks. I am unravelling a cardigan in that exact Country Silk colour. 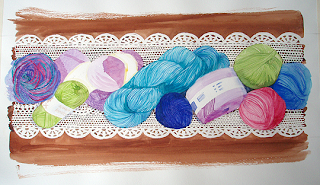 It is goegeous to knit with!!! Oh, I love the stylus jumper! I have several mechanical pencils and some pens that have a rubber grippy thing, and unfortunately they irritate my skin. Now I can go knit them all jumpers. When I first read about your pillow, I was thinking of the ones that are filled with the grains themselves instead of the husks. I have a rice bag I heat in the microwave (with a mug of water in there for safety) and use on my neck. Bless Lily's gallant little heart. Her twilight years are clearly filled with love and tender care. We should all be so lucky. The painting is sooo lovely! I'll have to find another source of income so I can buy all the wonderful Art my gifted blog buddies are producing. Lucky Husband. 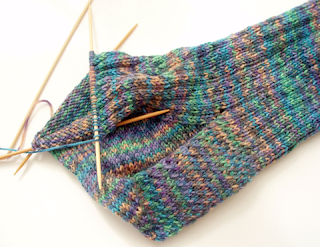 Pretty, pretty socks!! I second what Alwen said about grains. My mum has one with wheat in it. I reckon you could use burghal wheat, too. Or rice. Everything is looking so good! 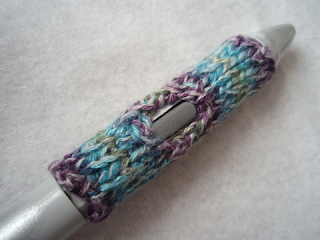 I remember when you made the stylus jumper. And you've worn through it! Amazing. Ah, bustal region shaping...the technical term!! short rows? 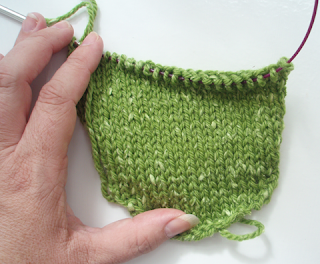 there was a good tutorial in Knitting Daily a while back. Love the painting and also the new blog look (am I late to the party on that one?!). 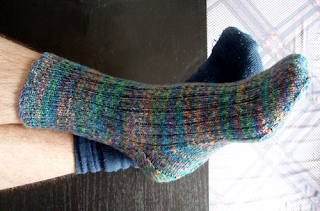 And husby's socks (lovely colours!). Lily clearly loves her Jejune-mum. Love the painting and the stylus jumper - aren't you clever - pats for Lily - and Knitting daily did a whole thing on darts and bust shaping with the tomato top! Oh, it's good to have you back and posting - I had so much to catch up on! Love the new painting, the stylus jumper (so cute! Would i-cording work for next time?) and the fun socks! And your new header, too! Oh P.S. Is buckwheat something I can get and send you? Let me know! so you can't have a mug on a mug but you can have a teacup on one? I loves my Jejeune blue willow mug, and I've never once thought that it was weird to have a painted cup on a mug. Another substitute for buckwheat is flax seed. Great texture. I too love your blue sweater and am amused by your colorful way with the English language--bustal region. 8^) I love messing things up--you know sometimes we say someone is inept (behind their back)? Do we ever says someone is EPT? Why do we have deranged but not ranged? Etc. Lovely Lily. Thanks for that photo of her. I can imagine her turning around two or three times before she got into that little tight sleeping curl. Lily is so gorgeous. Cisco had to go to the vet today - silly little thing hurt his dew claw, so now he has a leg that's all wrapped up in elastoplast, and a course of antibiotics! I'm glad to hear that Lily's still wagging. Neat-o! I love the colors of everything you're doing and Lily knows the best place to be is close to you!